New Professional Tablet Mount | ICWUSA.com Inc. The tablet rotates 360º and moves easily from portrait to landscape mode. Mounting arm attaches to horizontal surface with a clamp. Tablet secures to plate with adjustment knob. Does not include theft resistant fastener. Will this mount under a cabinet? 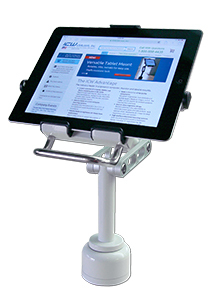 Thank you for inquiring about our Tablet Mount. Yes, the Tablet Mount can be mounted under a cabinet. A member of our sales team will contact you to answer any questions you might have.